We use Google sheets to create highly customisable charts, graphs, and projections using Google Analytics data for our clients on a single page dashboard. What’s more, our reports have been automated using an add-on for Google sheets. This saves us and our clients time because we no longer have to regularly retrieve data from the Google Analytics interface manually. In this post, I will outline how you can use Google sheets to set up a PPC analytics dashboard and how to create charts and projections in Google sheets. I will also explain how to automatically generate and send reports on a daily, weekly, or monthly basis. 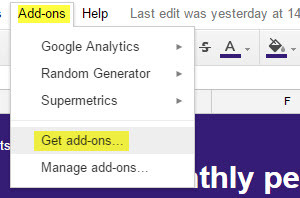 Next, search for and install the Google Analytics spreadsheet add on for Google sheets. This will enable you to retrieve data from any Analytics properties you have access to from the Google account you are using Google sheets on. The first thing to do once the add-on has been installed is create a brand new report. This will allow you to specify the analytics property (and view) that you’d like to report on and choose which metrics and dimensions to base the report on. At this stage, there’s no point spending time customising your report metrics and dimensions. This is because once you’ve clicked the ‘Create Report’ button, a Report Configuration sheet will be generated, which you can use to modify the settings of each report you’d like to create in far more detail. Report name – each report must have a unique name. Type – set to (core) by default. View (profile ID) – Google Analytics view ID. Start/end date – can be set manually or via date formulas. Metrics – see reference guide for all available metrics. Dimensions – see reference guide for all available dimensions. The remaining options are available to enable data sorting, segmentation and filtering, and to set the maximum number of results returned within each report. You can create Google sheets reports based on any data collected by Google Analytics, but for this post I will focus specifically on the creation of a PPC monthly performance dashboard. Later on in this post, I’ll explain how to set all of the reports to automatically update on a weekly and monthly basis. To ensure the dates are always current, it’s important that the start and end dates of each report in the config sheet (see above) are set using DATE formulas. In many of the examples listed above, the reports use data for the last complete month vs. the same month in the previous year. To get all the data required to make this comparison, you need to ensure that the end date of each report automatically updates to the last day of the last calendar month. The start date needs to be set 13 months prior to the end date column. Once your start and end dates match the example report configuration shown above, it’s time to navigate to Add ons > Google Analytics > Run reports. You will notice that each report (column of the report configuration sheet) is displayed on a new sheet without any formatting. To visualise this raw data, you must now create a dashboard tab to reference the data generated by each report, so it’s easily digestible via a single sheet. To create tables to display PPC metrics vs. YOY, top campaigns and top keywords, simply create a heading describing each of the reports and add relevant column headings as displayed in the examples below. You’ll then need to reference the cells containing the data in the individual raw data sheets you have just generated after customising your report configuration sheet and clicking ‘run reports’. To auto-fill the months prior to August 2017 as shown in this example, the formula was rolled backwards from the most recent month by changing the “-1” to “-2” for two months prior. This was done all the way back to “-13”, to give the current month and 13 preceding months. You can generate the trend lines beneath each section of the chart by using sparklines referencing the date in each column. To create the spend, conversion and revenue projection graphs you will need to utilise the FORECAST function for the month ahead. This is based on the previous months’ (or years’) performance. These projections can be particularly useful for ensuring spend is on track, and for spotting months in which performance (conversions or revenue) isn’t projected to be as strong as the comparison period. This will enable you to jump in and rectify any issues before it’s too late. Before you share the report, I recommend hiding the report configuration sheet and any of the individual sheets displaying raw data, so you only leave your dashboard visible. You can then enter the email addresses of anyone you’d like to be able to view your report using the sharing settings tab. 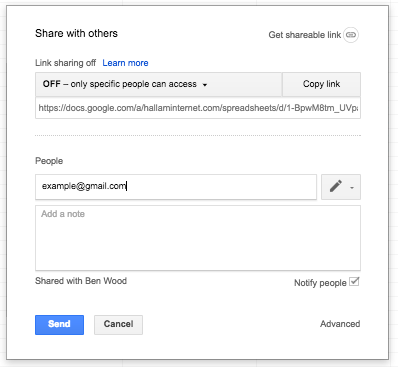 The people you share the report with will need to have a Google account too. Once you have set up your PPC performance dashboard and got to grips with the Google Analytics add-on and its associated metrics and dimension references, you can move on to create similar sections to display a range of other data. This can include organic performance data and email campaign performance, as well as data from other sources such as Google search console and Mailchimp. Hi Ben! Great read and I’ve been using this dashboard to track various metrics from my GA account. However I’m noticing some huge numbers for session duration in the reports. I’ve tried to filter and format this data in many ways and it hasn’t worked. Any suggestions? most of these are over 1,000 sec.